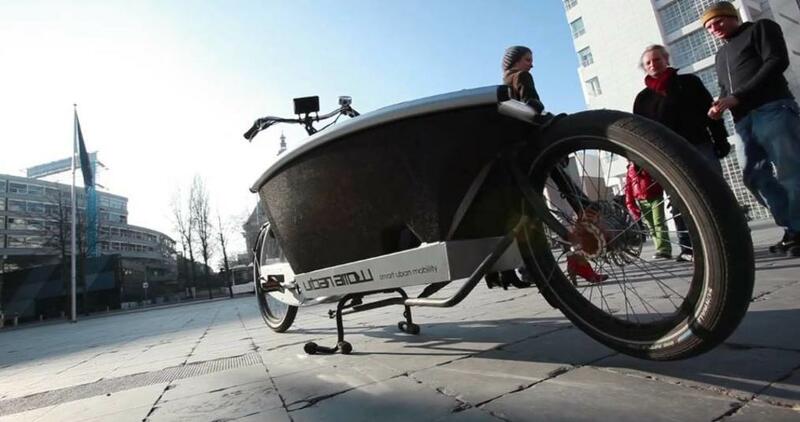 Three years ago, at the European bicycle industry trade show Eurobike, a stunning new family cargo bike appeared: Urban Arrow. Six are on their way to us right now. We are taking pre-orders. Urban Arrow Photoshoot (en) from epe on Vimeo. While we and many others love the supremely relaxed ergonomics and practical feature completeness typical of the Dutch family bikes we introduced to Portland, the fact that Portland isn't even nearly flat like Amsterdam means that their local appeal is skewed toward the very strong. Simply put, upright comfort and hill-climbing cargo capabilities are hard qualities to combine especially when the bikes themselves tend to be very heavy. Urban Arrow changes all this. It joins a lightweight frame, a giant passenger compartment, typically Dutch friendly ergonomics, a superior Bosch electric mid-drive with disc brakes, dynamo lighting, and NuVinci N360 continuously variable gearing in an iconic design by Wytze van Mansum. We've been trying to get these bikes since 2010. The company has understandably been keen to keep the product close to home in Europe to identify and resolve the first-generation problems typical of any ambitious new product before going big internationally, so we've left many business conversations empty handed. But now, finally, after some substantial specification changes and major awards later, Urban Arrow is coming to Portland! Normally we would hesitate to accept pre-orders on not-inexpensive items before we'd received any, but we're making an exception for these elusive, hotly desired bikes. Perhaps you too have been on the hunt for years. It's unclear how quickly we'll be able to receive more after these six are sold.